Brooks Egerton testifies in John Bernard Feit's trial for the 1960 murder of Irene Garza Tuesday, Dec. 5, 2017, at the Hidalgo County Courthouse in Edinburg. Egerton is a former reporter of the Dallas Morning News who interviewed Rev. Joseph O'Brien about Feit's involvement in the murder of Garza. 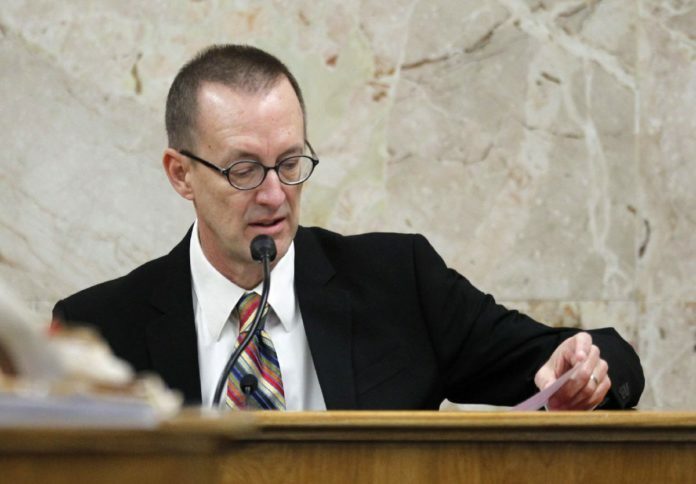 EDINBURG — The judge presiding over the John Feit murder trial overruled an objection from The Dallas Morning News, which sought to prevent a former reporter from testifying. The decision came after attorneys for the newspaper did not appear in court Tuesday morning. State District Judge Luis Singleterry subsequently overruled the defense’s objection to the same testimony from the journalist. Brooks Egerton, a former investigative reporter with the paper, was compelled to testify on the fourth day of trial about his 2004 interview with Feit’s supervisor at McAllen’s Sacred Heart Catholic Church, Rev. Joseph O’Brien. O’Brien, who died in 2005 at age 77, is considered a key witness in the state’s case against Feit, who’s accused of murdering schoolteacher Irene Garza in 1960. During the 2004 interview, O’Brien also told Egerton that he had suspected Feit almost immediately about Garza’s disappearance because Feit gave conflicting explanations for the scratches on his hand. “He said that they were fingernail scratches and that he saw them soon after the disappearance,” Egerton told jurors. Egerton’s testimony was the first time jurors heard mention of former District Attorney Rene Guerra, whose 32-year reign as district attorney ended in 2014, when he lost his bid for re-election to Ricardo Rodriguez Jr. Much of Rodriguez’s campaign focused on bringing the decades-long Garza cold case to trial. Titled “South Texas DA Refuses to Pursue Ex-Priest,” Egerton’s article focused on a perceived reluctance of Guerra to seek an indictment against Feit after new witnesses had surfaced, such as O’Brien. The interview occurred after Guerra, under pressure from Garza’s family, presented the case to a grand jury, which failed to indict Feit. When interviewed by Egerton, Guerra said he concluded that O’Brien was unreliable and questioned his mental condition, according to the article. This is a tactic Feit’s defense team employed Tuesday. In March, Guerra and Rodriguez are likely to face each other again as both are campaigning to run in the Democratic primary for district attorney. The outcome of the Feit trial may become an issue on the campaign trail.